Attorney General Jeff Sessions has launched a review of the law enforcement effort following a report that alleged the Obama administration stymied an investigation into Hezbollah’s drug-trafficking and money-laundering operations in order to avoid jeopardizing the plans for the Iran nuclear deal. The Department of Justice was ordered “to evaluate allegations that certain matters were not properly prosecuted and to ensure all matters are appropriately handled,” the agency said in a statement, according to The Hill. On Friday, Jeff Sessions ordered a review of prior Drug Enforcement Administration investigations “to evaluate allegations that certain matters were not properly prosecuted and to ensure all matters are appropriately handled,” Fox News reported. According to the report, the Obama administration tried to stop a Drug Enforcement Agency investigation, known as Project Cassandra, into Hezbollah’s criminal activities. A number of lawmakers have come out wanting answers to the report. Rep. John Ratcliffe (R-Texas), the chairman of a House Homeland Security Committee panel, praised Session’s decision to order the review. 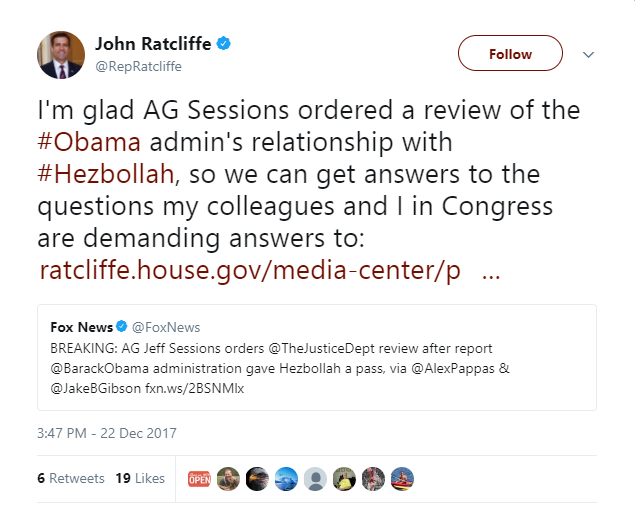 “I’m glad AG Sessions ordered a review of the #Obama admin’s relationship with #Hezbollah, so we can get answers to the questions my colleagues and I in Congress are demanding answers to,” Ratcliffe tweeted. However, former officials have denied the allegations, saying the reporter had a political agenda.